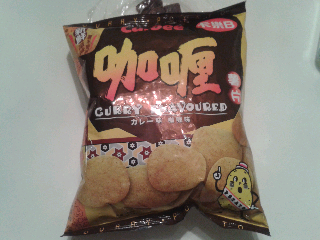 Tonight, i'd like to share my thoughts on these Calbee Chipes: Curry flavor. 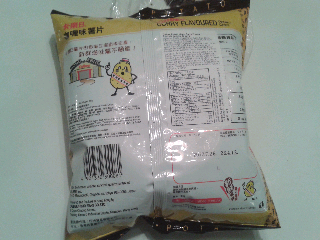 These were made in Hong Kong as opposed to what most people associate flavored calbee chips to be from (Japan). 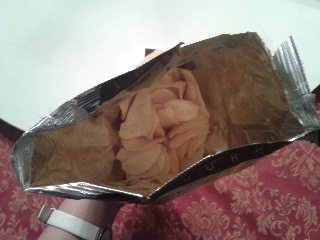 As with most chips from any brand, it is filled with air to hold freshness and once opened , the bag is only about half way full. After opening the bag, there was a definite curry smell to it, mainly of what reminds me of curry powder (as opposed to say thai red curry, etc). taste wise, I will have to honestly say that I am kind of disappointed. I was hoping for a strong intense curry flavor, or at least around the same level as some of the Japanese curried snacks i've had. I even had my mom try it and she did not like this at all. I asked her if it was the curry flavor but she said that it just tasted bad to her and would never repurchase it again. 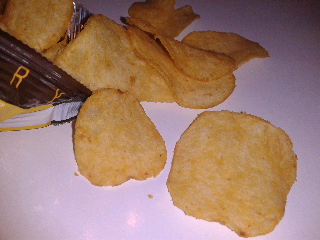 I would probably not repurchase this item again either and rather buy heartier snacks with curry flavor. 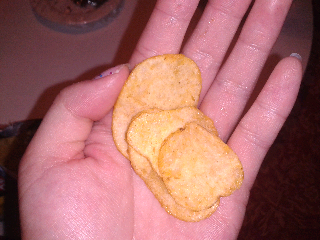 I feel that the chip size and texture (being so thin and all) does not fit well with this flavor either.